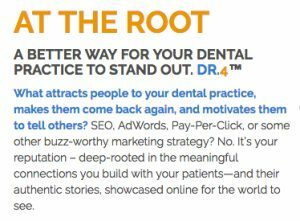 For hundreds of dental offices, Dentist Profit Systems has recommended the following foundational digital marketing content that is optimized frequently for search engines and organic reach. The “secret sauce” that has had real impact is our ability to uniquely script content that showcases the dentist’s ability to connect with patients and provide expertise in the services they seek. Custom authenticity makes dentists stand out wherever patients look on the Web. We recommend that all sizes of practices have ALL of the following — not just pieces of this list. When we create a marketing proposal for potential clients, we collaborate on branding messages, determine expertise and distinguishing aspects of the practice, and outline hundreds of details. We analyze the local demographics and competition, as well as the current online marketing status of the practice. All of this ground work is done free of cost. If you are interested in a proposal for your practice, we invite you to reach out. The cost associated with effective marketing is substantial. When new dentists come to us, we often help them secure a loan to cover their initial marketing budget and achieve a digital marketing foundation. ROI is what we’re all about!